Description: All-purpose yeast leavened dough sheets that provide a base for all your "Baked from Scratch" savory or sweet recipe creations. It is convenient and ideal for applications like hors d’oeuvres, crostini, pot-pie, calzone, stromboli and even desserts. 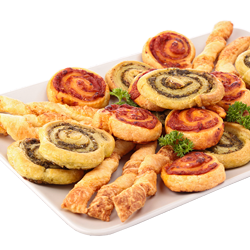 The low protein dough is uniquely formulated to rise in the oven, which creates an exceptional quality crust for all your recipe ideas. Manufactured in a facility that uses eggs, milk, nuts, soy and wheat. Preparation: Thaw the preportioned sheets for about 20 minutes. Stretch or roll, top or fill and bake. Do not eat raw dough. Follow recipe directions for baking at proper temperatures and for specified times. Serving Suggestions: Calzone Recipe 1 CT Readi-Dough sheet 1 CT Marinara Mini 1∕3 cup CT Mozzarella Shreds 1/4 cup grilled sliced mushrooms Pre-heat oven to 400°F. Lightly spray baking sheet with cooking spray. Roll dough to 8” circle. On half of circle, within ½-inch of the edge, spread sauce then add cheese and mushrooms. Fold dough half over filling; firmly press edges with fork to seal. Bake 15 minutes or until golden brown. Ingredients: Water, wheat starch, psyllium fiber, polydextrose, canola oil, sugar, leavening (sodium acid pyrophosphate, sodium bicarbonate, monocalcium phosphate), modified cellulose, xanthan gum, salt, yeast, calcium proponate (preservative) fumaric acid and sorbic acid (preservatives), hydrogenated vegetable oil (contains one or more of the following hydrogenated oils: soybean oil, palm oil, and cottonseed oil and mono and diglycerides). Contains wheat and soy.